Buying or selling a home is an investment that matters. Customer service, communication and experience make our Centreville Office Agents the professionals of choice. 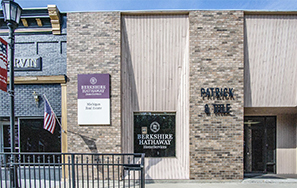 Knowledgeable about the entire real estate transaction, understanding of market trends and the local St. Joseph County communities make us the superior Berkshire Hathaway HomeServices agents. We live, work, and play here. We know St. Joseph County! Not only are we your local experts we are very familiar with the surrounding areas of Southwest Michigan such as Branch, Calhoun, Cass, Kalamazoo, and Van Buren counties. We are here to help you search for Real Estate and Homes for Sale in Southwest Michigan or sell your current home. Did you know that we are located half way between Chicago and Detroit? Not only are we a great community to live in all year long, but we make an excellent vacation destination! Our wonderful county is home to several Lakes: Lake Templene, Klinger Lake, Omena Lake, Palmer Lake, Cade lake, Clear Lake, Corey Lake, Fisher Lake, Grey Lake, Long Lake, Minnewaukon Lake, Pleasant Lake, Prairie River Lake, Sand Lake, Sweet Lake, and Thompson Lake is just a handful of our many lakes. St Joseph county is also home to several rivers including the St. Joseph, Portage, Rocky and Prairie Rivers all of which make wonderful waterfront properties. Love camping and trails, check out the Michigan DNR or River Country site. They are an excellent source of what's available in St Joe. Love to Golf? Pine View Golf Club, Island Hills Golf Club, Klinger Lake Country Club, Sauganash Golf Club, Green Valley Golf Club, or St Joe Valley Golf Club are just a few course in the area. Looking for festivals and local entertainment check out River Country Tourism. Don't forget the annual St Joseph Grange Fair. Check out their site for for all the activities during the year at our fairgrounds. We work tirelessly to provide our clients with the most positive experience possible. Technology is integral in today’s real estate industry, and we provide our clients with cutting edge web site technology and marketing, including Seller Advantage! This is just one of the reasons that we are one of the most respected real estate companies in our area! Conveniently located across from the Centreville courthouse stop by or call one our friendly agents. Jenny, Justin, Shelah, and Gregg are just a phone call away to start your new home ownership journey.